« Vegetarian Breakfast – Bagel w/Cream Cheese, Tomato, and… Bacon? Chia Seeds – Give Them a Try! So what exaclty are chia seeds? Chia seeds come from the Chia plant, which is native to both Mexico and Guatamala. High in omega-3 fatty acids as well as dietary fiber, chia seeds are a great way to add these two essential items to your everyday diet. 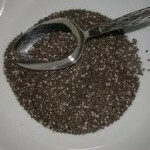 –Chia Seeds are full of nutrients! –There are about 140 calories in a 1-ounce serving of chia seeds. –Glycemic Load is very low –There are about 12 grams of carbohydrates included in a 1-ounce serving of chia seeds. –A 1-ounce serving of chia seeds can provide nearly half of your daily fiber intake! You can choose to add the chia seeds to your water (or your favorite drink), although know that they will become gelatinous, or you can grind them for a smoother drinking quality. Or add them to your yogurt like I do every morning for a nutritious breakfast. They fit in perfectly with my flax seeds and granola! Also, you can add them to your oatmeal or in your next batch of banana bread. All you need is about 2 – 3 tablespoons (1 ounce) to receive the many benefits derived from consuming chia seeds. Although I really don’t agree with being sneaky about food when it comes to kids being picky eaters, integrating chia seeds into pancakes, muffins, or essentially any food that your child currently eats can be quite easy to do. I only suggest this for kids who are super picky and thus not open to trying any new food. 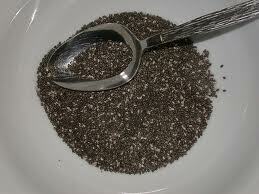 I’m sure there are many, many more ways in which you can add chia seeds to your everyday diet. Since I’ve only found out about chia a couple of months ago, I would love if you would please share some of the ways you currently use chia seeds. We’d love to hear about them!